After hours on the road the clock nears 3am; Sputnik starts acting finicky & breaks down....again. This time on a chilly night beneath the snowy Range of Light. Instead of pushing the car into the small town of Lone Pine immediately, we decide to set up camp & wait till day break when the shops will be open. At least we were lucky enough to have a great view beneath the sky-scraping crown of Mt. Whitney. Out of all the places we could've broken down, this a'int half bad. Once the sun rises we see how truly prime our locale is under the shadow of Mt. Whitney. Sometimes the best sites are found under the oddest of circumstances. 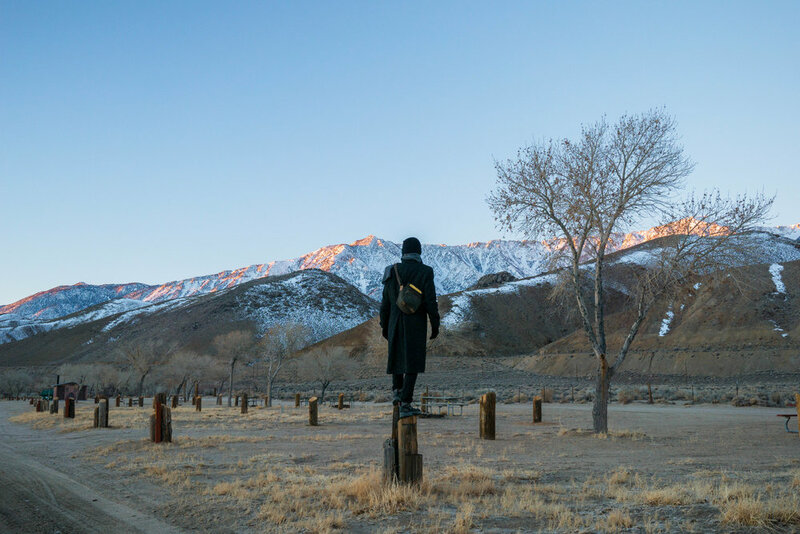 Stoked on our surroundings & the rare splash of snow in the foothills, we venture off on an early morning stroll. The rocky Alabama Hills are normally free of snow, but a late winter storm created a beautifully rare contrast. As we take a quick look at the engine we realize we're on a tall enough slope to roll Sputnik the full two miles to a parts shop. Down at the shop, Matt works some magic to give us a temporary fix even though they didn't have the part we needed. We didn't know it at the time, but Sputnik ended up having a blown camshaft; this caused us to have no torque & painfully slow speeds uphill. All the while being 300 miles from home. Worried we'll get truly stranded, we find a campground on the way back home & discover a hidden gem 15 miles from the auto parts shop! 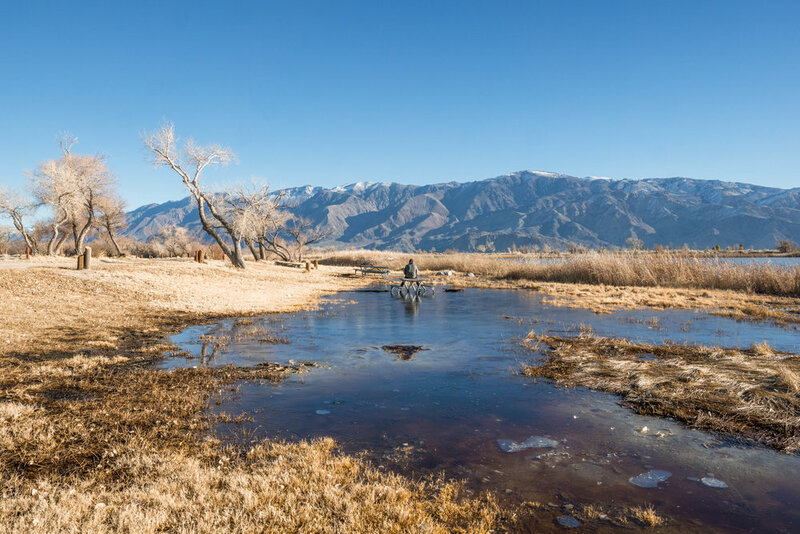 The huge Sierra snowfall created massive runoff that caused this lake to overflow into a series of ponds inundating several camp sites. 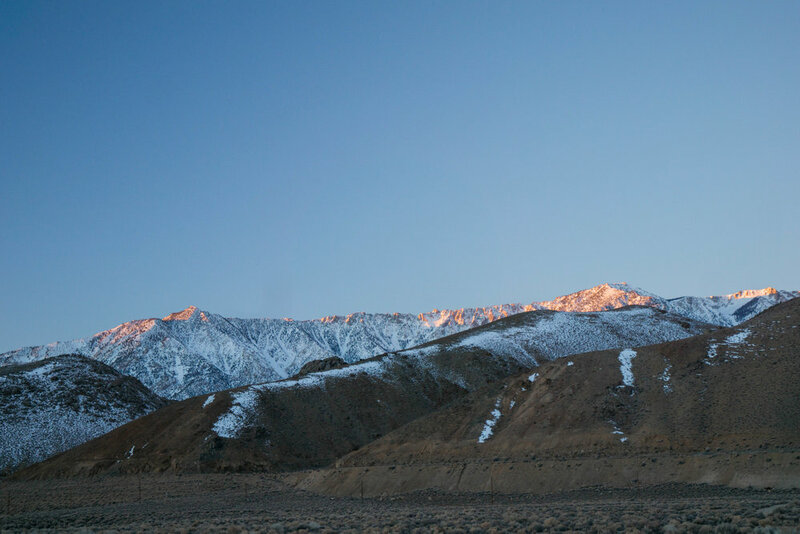 In a race against the sun we set off towards the foothills with a lofty goal to reach that snowy peak hiding in the distance. Closer to rock mounds we discover a series of tunnels. This half pipe spits us out above the LA aqueduct. The story of how LA acquired rights to this water almost 300 miles away is actually an interesting one. After LA acquired the water rights, the once massive Owens Lake was drained to an alkaline dust bowl. Wild West style seizures were under taken by Lone Pine residents but their efforts failed. Higher up in the foothills we climb our way through a narrow opening between a collection of massive boulders. Beyond the boulders we glance back to gander at the opposite mountain range radiating in alpine glow. Alas, after a whole hell of a lotta climbing we reach snow & gain a rad glimpse of the monolithic Sierras. Listening to our stomachs, we decide to clamor back down to camp after one last look. Back at camp, we warm ourselves around the fire as the stars peak behind the clouds to begin their nightly dance. Now out of firewood, we set our sites to stargazing amid the mesmerizing reflections of the flood pond. 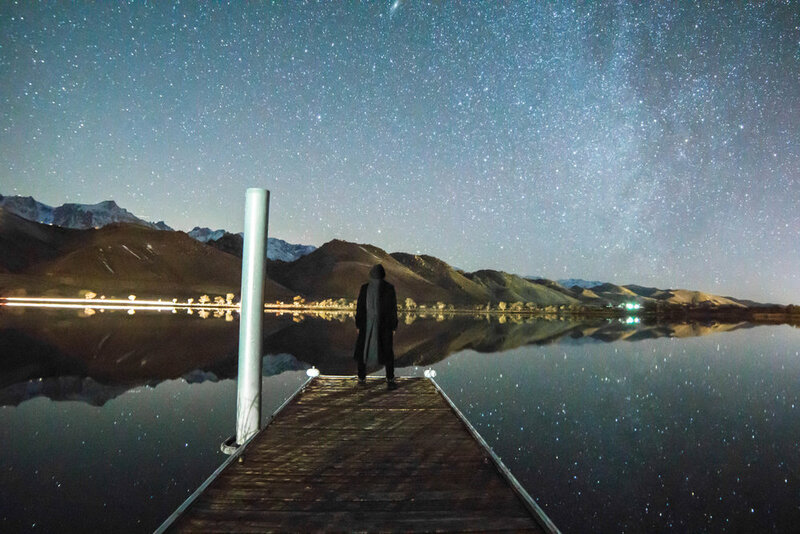 Like bonafide Milky Way hunters, we walk to the docks on the other side of the lake, even though its a too early in the year to see the galactic center. This is why sometimes tents are better than hotels. You don't just have a great view, you're in one. Alpine Glow! The mountains reach so high into the sky they actually turn pink, red & orange just like the clouds at sunrise. Temperatures dipped so low during the night the flood pond froze over. True peace. We would have never found this campsite if Sputnik hadn't broken down. Like we always say, the best moments of a Misadventure are usually the unexpected ones. While frozen, the thin layer of ice made it necessary to tightrope across mini land bridge. The suns golden glow burns away all memory the prior nights shivers & shakes. Seriously nothing as euphoric as the feeling of the first morning rays. Sunrise fully & warmth absorbed, I get back to camp & notice the pots we had soaked through night froze over too! With Matt now woken up we head back to pond for some more fun. Skipping rocks across the frozen ice creates the oddest sound. To get an idea of how flooded it was, this area encompasses 3 different campsites. I mean how cool is this?! The extra water created a marshy wilderness ripe for morning misadventures. Like diamonds the ice shards glimmer under the quickly rising sun. Hesitantly we now decide to limp home with Sputnik. Somehow made it back without getting stuck.